I am uploading this version with full mq4 format files.The idea being that fellow traders will amend and improve on existing files and upload their improvements on to the forums for other traders to use and improve their chances of gaining more pips. This system is currently being road tested but due to the amount of traders wishing to be beta testers I have decided to post it up on the forums to gain early feedback. The system uses the 1hr timeframe to trade and attemps to identify short term trend cycles from higher time frames on the individual pair traded. On the 1hr chart there are two higher timeframe PriceChannels (being 4hr & Daily) to help the trader better analyse market conditions. There are two templates with this system:!XPS v6 rc001 for standard accounts!XPS v6 rc001m for mini accounts that show pairs with a small m (EURUSDm) in their accounts. The inner PriceChannel alarm, outer PriceChannel alarm, the Scope alarm for crosses and the Oscillator alarm for pending change in trend. Basically, once the Oscillator has changed colour then we are looking for price to cross the line giving us an entry into the new trend. This is then enforced with the changing of the Inner PriceChannel which uses a higher timeframe than the current timeframe being displayed. The Inner Price Channel has been automatically set for you. 1min TimeFrame will display a 5min Price Channel 5min TimeFrame will display a 30min Price Channel 15min TimeFrame will display a 1HR Price Channel 30min TimeFrame will display a 4HR Price Channel 1HR TimeFrame will display a 4HR Price Channel 4HR TimeFrame will display a Daily Price Channel Daily TimeFrame will display a Weekly Price Channel Weekly TimeFrame will display a Monthly Price Channel As too the Outer PriceChannel is also automatically set for you. FRACTAL MATHThe fractal math will show you overbought(+2/8 & +1/8)/oversold(-2/8 & -1/8) areas where price will probably turn around.The menu within the fractal math allows you to choose the following:-Show text on screen.show lines on screen.set the number of bars wide for displaying the lines.show shift lines on screen where the frame will change should price exceed the shift line. show comments.show 1/3rd lines within the larger lines.allow you to adjust type of 1/3rd lines plus color.show color frame on screen. adjust the frame color settings. 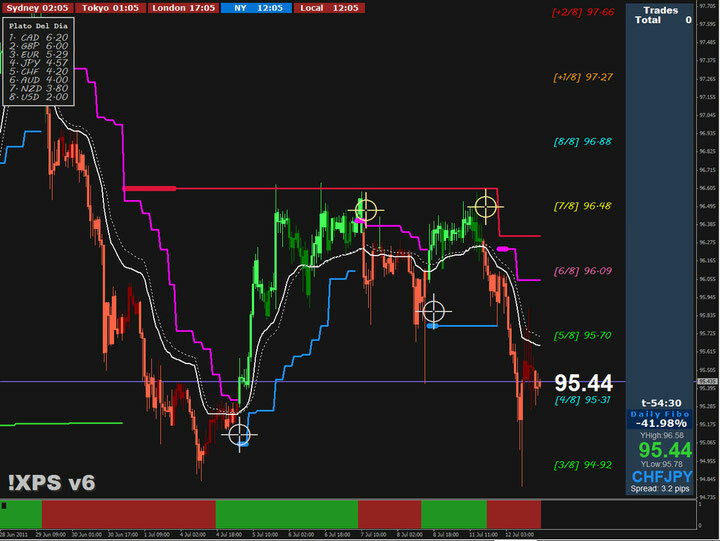 XARDBUYER script enables you to take a BUY on the pair that is viewed on screen provided that the Bullish Trend is True. If the Bullish Trend is false then the BUY will be refused. XARDSELLER script enables you to take a SELL on the pair that is viewed on screen provided that the Bearish Trend is True. If the Bearish Trend is False then the SELL will be refused. XARDCHICKENSWITCH script enables you to Close ALL Trades currently running. XARDCLOSEPROFIT script enables you to Close ALL Proftable Trades that are running. XARDCLOSELOSS script enables you to Close ALL Losing Trades that are running. SHOWMEAGAIN script allows you to see the Previous Message Alerts on Screen. After copying the scripts over to experts/scripts folder you will need to restart MT4 and go to Navigator/Scripts.Then simply right click on a script and select HOT KEY. I hope this helps explain a little of what XPS v6 can do for you. Oh for those of you having trouble reading the Profit pips & total i.e. display is only showing one tenth of the true amount....say you have made 20pips but it only displays 2pipsPlease remove the !XPS v6 PROFIT and replace with !XPS v6 PROFIT x10 indicator which should resolve the problem. When placing a trade, use the buy/sell scripts, that way you will reduce Casino Bets as you will only be able to trade in the direction of the Oscillator (Green color will allow UP Bets only and Red color DOWN Bets only). You place one pair two trades with the trend and that is your maximum bet for that pair in that trend. If the trade goes sour on you...do not add to the trade and do not adjust the stop loss once set.You can exit a trade before the stop is hit but never adjust the stop once placed. If you trade with the trend then you reduce the risk factor, if you trade against the trend you Casino Bet. The house will always win Casino Bets, remember that. So no trading against the trend, you are not that smart, if you were you would not be trading forex, instead you would be collecting a big fat cat bankers cheque every month. Some ppl may look at some of this code and say hey, parts of this is my code. Well sorry for your luck. If you were stupid enough to post YOUR CODE up onto the WEB and only God knows how many times it has been downloaded, dissasembled then reasembled by God knows how many other ppl then re-posted for search engines the world over, then let me repeat myself one more time...SORRY FOR YOUR LUCK. If I download a peice of code from Google, Bing or Forum then it is mines to use and abuse in any way I see fit.It becomes OpenSource and as such I will post it up to the same Open Forums that are available on the WEB. If you want to keep your code PRIVATE then I suggest you do just that and do not post it up ANYWHERE on the WEB. How hard a concept is that to understand. Release Candidate 002 now available. The Scope indicator has been removed. The !XPS v6 Oscillator has been updated to !XPS v6 Oscillator v2 with amended settings. The BUY/SELL scripts have been amended to use the new !XPS v6 Oscillator v2. The Onscreen !XPS v6 text has been removed from the bottom of the left main screen and placed in the sub-window. Release Candidate 003 now available. The !XPS v6 Oscillator v2 has been updated to !XPS v6 Oscillator v3 with amended settings. You can look towards going long when the Ocsillator is above the +0.5 level. You can look towards going short when the Oscillator is below the -0.5 level. The BUY/SELL scripts have been amended to use the new !XPS v6 Oscillator v3. Have added the next higher PriceChannel levels so on a 1HR chart the PriceChannels will display 4HR, Daily and now Weekly levels to help you with your overall Market Analysis. Release Candidate 004 now available. The !XPS v6 Oscillator v2 has been restored with it's original settings. I have added Ishark to the sub-window to help with filtering direction. The BUY/SELL scripts have been amended to use the restored !XPS v6 Oscillator v2. I really like the price channels of this method. However, since new mt4 600 build, they are not working. Any advice or reworked code available? Or even just the logic behind them and then I could come up with something.